“Extremely Loud and Incredibly Close” was touted as one of the most important films of 2011, but it has been held back for very limited release and started in the DC area today. The main elements of this film are a gifted but mildly introverted boy Oskar (Thomas Horn, 13 when the film was made), his family in NYC, and the loss of his father (Tom Hanks) in Tower 1 of the World Trade Center on September 11, 2001. Sandra Bullock plays the mother, who has to deal with the fact that she was not as “with it” on Oskar’s gifts (and emotions) as the father had been. Oskar displays most of his talents in the physical world, with scrapbooks and art, as well as mathematical calculations – in the film, he shows little interest in computers, even though kids were already very fluent in them by 2001. His father had invented a “Santa Claus” myth of a sixth borough of NYC, somewhere else in space time. As the film starts, Oskar (narrating) says there are more people alive today than have passed away, which I don’t think is actually correct. Sometime after 9/11 (Horn’s voice was just starting to change when he acted in the film, and scenes had to be shot in real chronological sequence), Oskar finds a key in a vase in the house, almost by accident, with a note from his dad to look for the lock where it fits. Oskar takes it to heart, and enlists the help of an elderly mute renter (Max von Sydow), living in his grandmother’s house across the street, with a mysterious connection to the family. Oskar has learned from dad that he was not “up to having a family”. Oskar manipulates (even regiments) him into helping, and in an odd exercise of human relations by someone with very mild Asperger’s, almost has to play disciplinarian with the old man. He even asks him some personal questions from a printed list (including, do you have children?) A family secret will be on the line, and then so will one for another family. But the backdrop of the film is the unfolding of that “worst” day, when Oskar found six messages on his phone’s answering machine, from his father, caught in the North Tower above the area of the plane strike. (Cell phones were more primitive then.) Much of the horror of that day is reenacted (even visually) in relation to these messages (especially the very last one), and that plot device forms the basis for other metaphors in the movie. Oskar challenges his mother to make sense of what happened, why the perpetrators would do what they did, and she says it doesn't make any sense; it never can. Stephen Daldry directed this film for Warner Brothers and Paramount, with script adapted by Eric Roth from the novel by Jonathan Safran Foer. Under a Steven Spielberg, the film might have been a bit lighter. The Montgomery County Police Department (from Maryland) offers a seven minute video, narrated by police chief Thomas Manger, “The Seven Sings of Terrorism”, in the middle of the page at this link. The link will open a new window, and Windows 7 or Vista will request permission to run a new application to show the video. This is not a typical format like YouTube. The seven signs include noticing unusual surveillance, or “elicitation”, people asking unusual questions or taking photography in an unusual manner about potentially sensitive locations. It also mentions unusual purchases of supplies (such as raw materials for weapons). The video does not discuss cyber threats. But they are worth noting. For example, most people know about “Nigerian scams” and phishing attacks. But bloggers and journalists should be alert if they receive unsolicited information (by email or maybe social media) that does not seem like spam and seems totally inappropriate or “steganogrphic”, as an invitation to meet someone in an overseas location or a domestic location that one has no intention of visiting. The MCPD link is here. "Tornado Alley": IMAX 3D film documents efforts of "Vortex 2"
“Tornado Alley”, a new 40-minute IMAX 3-D film from Sean Casey, follows the efforts of a tornado-hunting group called “Vortex 2” in the American Great Plains. Using an armored 200-mph-windproofed vehicle that Casey built himself in California, Casey finally sits inside a tornado. Vortex 2 has a detailed website about tornado research, here. The film does not identify the specific locations it chases tornadoes; the license plates suggest eastern Colorado as the site for climax. A town with houses is shown just as a tornado approaches, and the aftermath is shown, but the town is not identified. I saw this in the Smithsonian Natural History Museum Imax auditorium. The film was produced by Giant Screen Films and the Discovery Channel. Wally Kennedy has a video on YouTube, put up by the Joplin Globe, where graduate students accompany the team. Wikipedia attribution link for multi-vortex tornado in Dallas in 1957. The film has many shots of multi-vortex tornadoes. If the 2011-2012 La Nina winter is unusually warm, how will the tornado season shape up in the Spring? The 2011 season was severe because the deep snowpack in the Rockies prolonged the cold air feeding into the Great Plains, to clash and spin with air from the Gulf of Mexico. Many of the worst tornadoes (Tuscaloosa, Joplin, even the Raleigh suburbs) wore farther East than usual as a result. Tornadoes can occur almost anywhere and in any month of the year. On November 17, 2010, there was an F0 (maybe F1) small tornado in Arlington VA near the Hospital Center that did a lot of tree and power line damage, around midnight, when the air temperature was "only" about 65 degrees F. Winds 50 feet above the group were probably over 90 mph at one street intersection, but the funnel was very small, probably less than 30 feet in width. 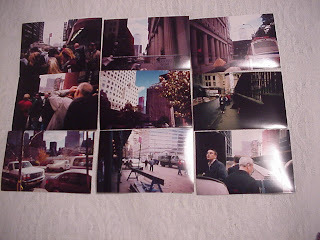 Damage, below. Second picture (mine): Angry clouds near Ohio Turnpike in Oct. 2010, but cold front had already moved through. One thing I remember about boyhood summer trips to Ohio from Virginia: the weekly thunderstorms were far more violent in Ohio. We used to watch them from the porch, drinking Koolaid. A review of Sony's "Take Shelter" appears on the Movies Blog Oct. 15, 2011. A review of Leonardo Di Carpio's "Greensburg: A Story of Community Rebuilding" appears on the TV reviews blog April 15, 2009. Tonight (Jan. 4) PBS Nova aired the 50-minute documentary “Deadliest Volcanoes”. The link is here. 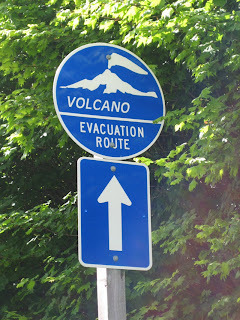 (Oddly, there is another link called “deadly volcanoes”). The program presented the danger of the mid-plate Yellowstone supervolcano, which could bury over half of the US in ash, and completely obliterate several thousand square miles, and introducing a years-long cloud, seriously jeopardizing all civilization. It’s been 600,000 years since the last eruption, so we could be due. The program covered the science of looking at supervolcanoes underground with muons, and other instruments to locate concentrations of sulfur dioxide. Many supervolcanoes have a “lava lamp” vertical channel underneath going 50 or more miles down below. In 2004, the History Channel aired “Pompeii”, which dramatized the notorious 79 AD eruption. The program was widely advertised on the DC Metro as a major television event. Another risk is that a lahar (mud flow) off Mount Rainier could jeopardize Tacoma and even Seattle, even without a major eruption. Evacuation would be difficult. Wikipedia attribution link is here. In Chersky, Russia, a geophysicist bought some land and replanted it with grass to make it more reflective, to hold down the melting or permafrost (near the Arctic Ocean, northeast Siberia), and releasing enormous amounts of methane, a much more effective greenhouse gas than even carbon dioxide. Here’s a 4 minute YouTube video “Save our Planet: Account from scientists calculates methane emissions from fresh water”, as well as ocean water. 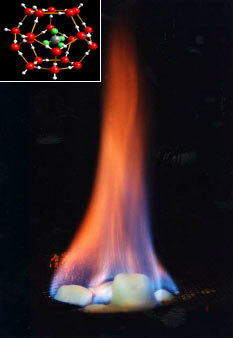 Wikipedia attribution link for picture of burning methane hydrate.